In a recent post on The Outlook for Global Inflation in 2014, I noted that the consensus forecast for global inflation appears to be the lowest on record. I also pointed out that while inflation is considerably lower in Developed Market (DM) economies than in Emerging Market (EM) economies, current inflation drivers are much stronger in DM than in EM. In that post I suggested that “with the global economy building some momentum going into 2014, and with the lagged effects of massive monetary policy accommodation still in the pipeline, it seems very possible that global inflation could be higher in 2014 than the record low forecast”. Subsequent to that posting, I read an insightful research note by the estimable Russell Napier of CLSA written in November 2013 entitled “An ill wind”. In the note, Napier argues that falling export prices from Japan, China and Korea constitute an ill wind from the East that will continue to blow in 2014 risking further declines in inflation in the US, Eurozone and other DM economies. Napier’s note got me thinking that preferred portfolio allocation in 2014 will be very different in the scenario I outlined, in which inflation turns out to be higher than expected, than in as Napier's scenario, which anticipates an accelerating move toward deflation. As this post will explain, either upside surprises on inflation or a move toward deflation could have highly negative outcomes for equity-heavy portfolios. A very useful contribution of Napier’s note is that he draws attention to three leading indicators to keep an eye on to help gauge which direction inflation is likely to take. He urges investors to watch TIPS-implied inflation (using 5-year breakevens), copper prices and corporate bond spreads, which he believes can give an early read on whether benign disinflation it tipping towards dangerous deflation. 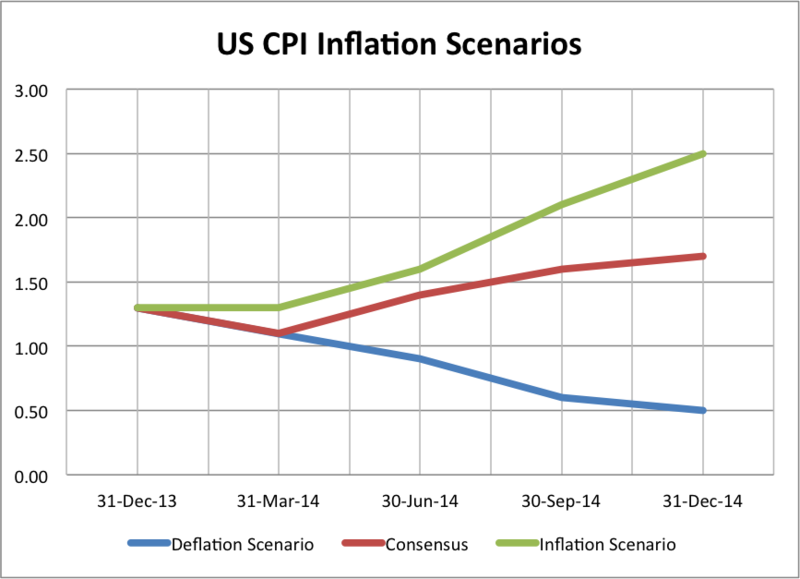 The scenario paths of US CPI inflation are show in the chart below. The comfortable Consensus expects US inflation to continue to fall in 1Q14 but then to rise modestly to 1.6% in 4Q14. In the higher than expected inflation scenario, stronger US growth against a reduced potential growth rate results in a quick move up in inflation to 2.5% by yearend. 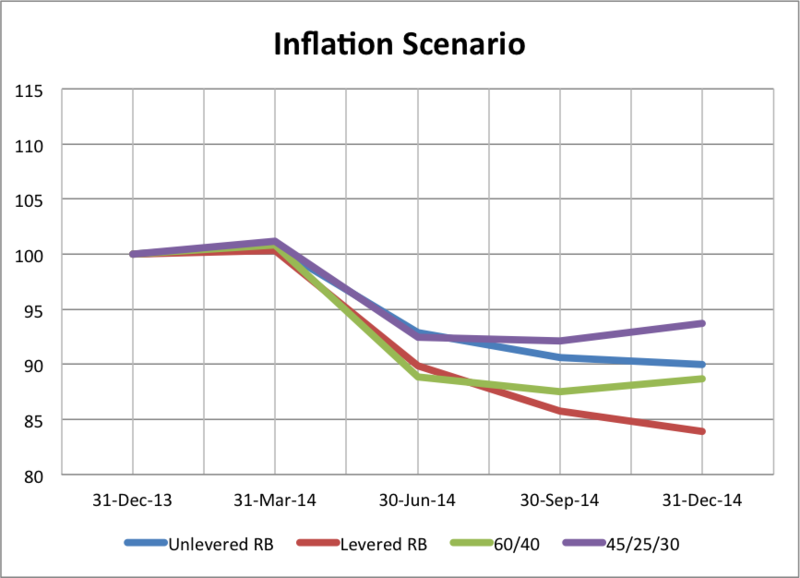 In the Napier-type deflation scenario, US inflation continues to drop well below 1% as 2014 unfolds. 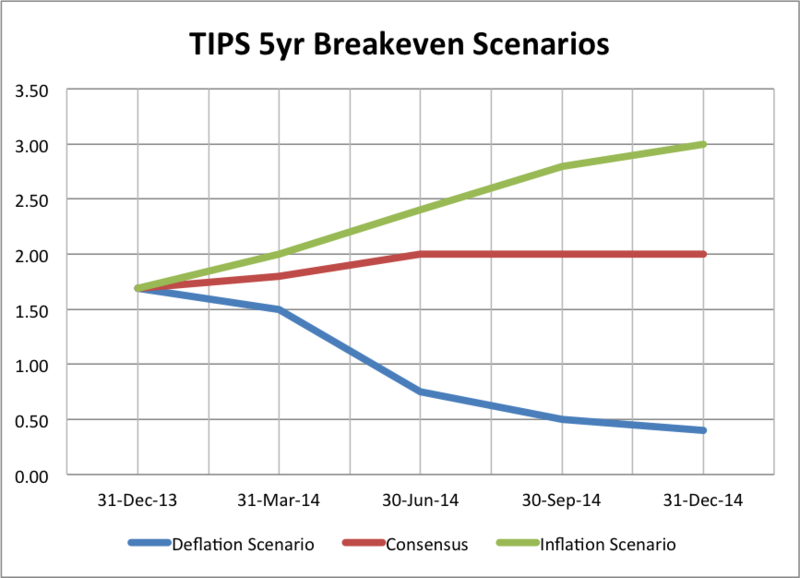 Under these three scenarios, inflation expectations as expressed in US TIPs Breakevens would unfold very differently as shown in the chart below. 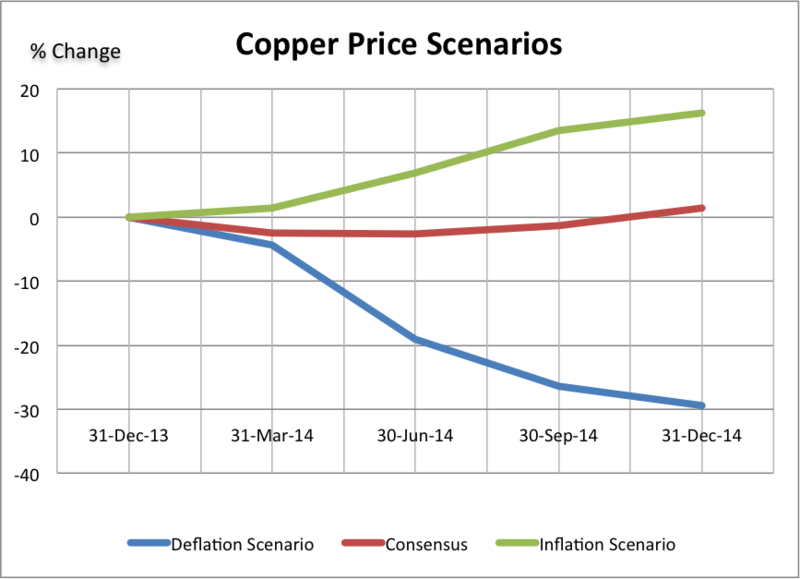 Copper prices, which are very sensitive to growth and inflation expectations would also trace out very different paths in the three scenarios as depicted in the chart below, which shows expected copper price changes over the year. 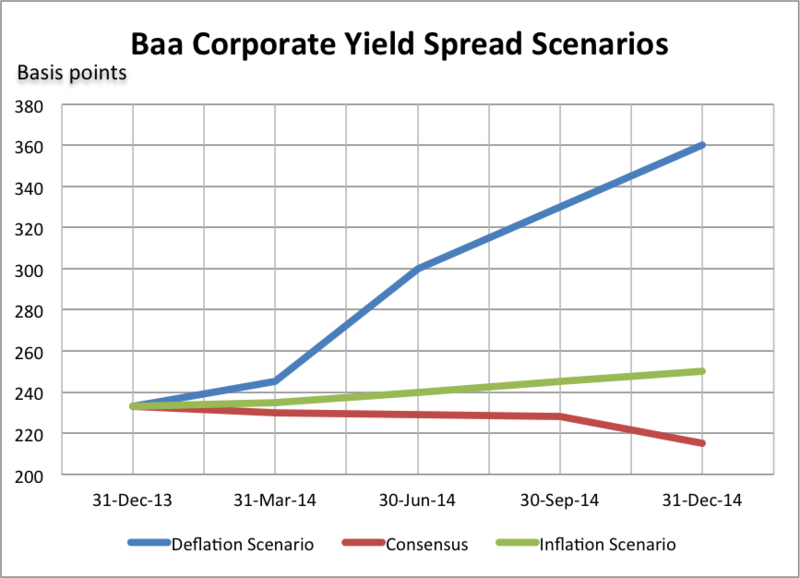 Finally, corporate bond spreads would behave very differently under the three scenarios. Napier’s review of the behavior of the Baa corporate bond spread ahead of the stock market declines of 1998, 2001 and 2007-08 suggests that corporate bond spreads do tend to spike in deflationary episodes, but that they are not as timely a lead indicator as TIPs breakevens. Nevertheless, these deflationary experiences all saw spreads widen to more than 300 basis points. 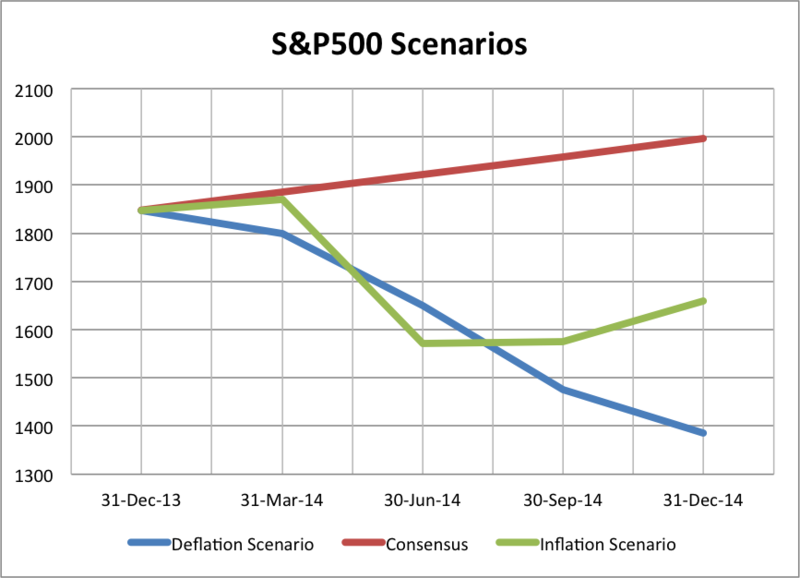 Markets would behave very differently in the three scenarios outlined above. I have relied on Napier’s research and my judgment of recent market correlations to come up with what I believe would be the likely outcomes for key equity (S&P500), bond (10-year US Treasury yield) and currency markets (the Canadian dollar exchange rate USDCAD), which are of particular importance to Canadian investors. The charts below trace out the likely paths of these key market indicators in the three different scenarios. · Consensus expects that with a modest rise in inflation in 2014, the S&P500 will post a decent gain of about 8% to close to 2000, the 10-year UST yield will continue to rise to 3.75% and Canadian dollar will end 2014 little changed with USDCAD at 1.06. · The Inflation scenario, which sees a rise in US CPI inflation to 2.5% this year, would see the S&P500 falling 10% to 1660, the 10-year UST rising to 4.15% and the Canadian dollar strengthening with USDCAD falling to 1.02. · In the Napier-like Deflation scenario, the S&P500 would likely face a drawdown of 25% at some point in 2014, while the 10-yr UST would fall back to 2.25% and the Canadian dollar would weaken sharply with USDCAD rising to 1.20. Asset class returns would vary quite dramatically across the three scenarios that I have sketched out. The chart below depicts the expected Canadian dollar total returns on the major asset class ETFs that I write about in this blog under each of the scenarios. The results indicate that investors are walking a tightrope between deflationary and inflationary outcomes. Let us hope that the Consensus proves close to the mark because the outcomes in both tails of the inflation probability curve are not good. Given this set of ETF returns, how would different portfolio structures perform? The charts below show expected returns to four different portfolios that I regularly track under each of the three scenarios. 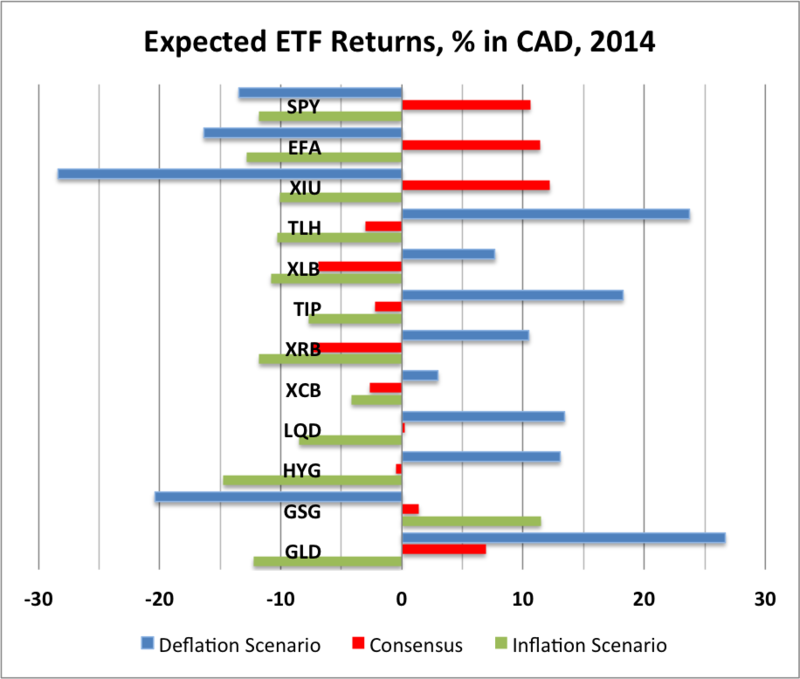 The Consensus scenario provides unexciting returns for Canadian investors. But after strong returns in 2013, this would not be a bad outcome. 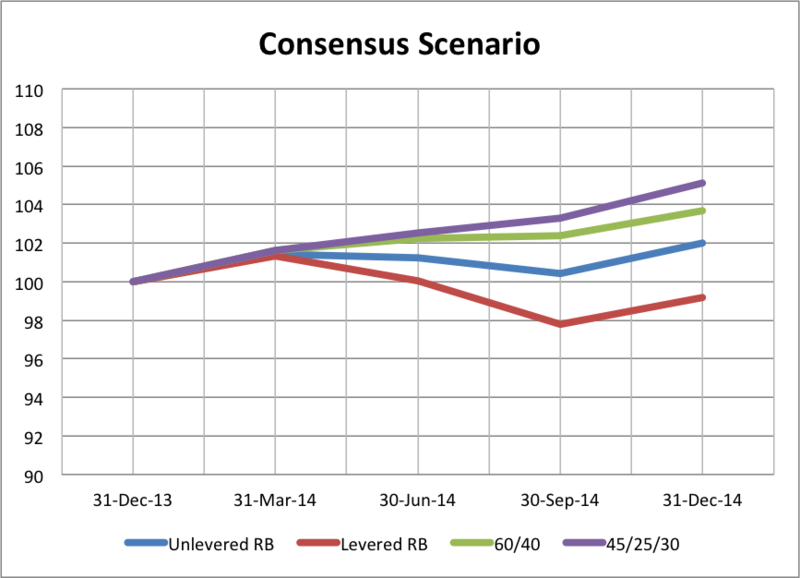 Equity and credit heavy portfolios will perform best if the Consensus proves accurate. Risk balanced portfolios that have larger weights in government nominal and inflation-linked bonds and commodities would underperform as they did in 2013, with the levered version of this portfolio structure performing worst. The Deflation scenario would provide negative returns for Canadian investors if they were invested in conventional equity and credit-heavy portfolios. Such portfolios would be supported to some extent, however, if they have significant foreign content as Canadian dollar weakness would tend to temper losses on USD denominated ETF exposures to foreign stocks, credit and commodities. Global Risk Balanced portfolios would perform best in the Deflation scenario, as they would benefit from their larger exposure to government debt, which would benefit from falling 10-year UST yields. Inflation-linked bonds would underperform nominal bonds but would still provide positive returns. The Levered Risk Balanced portfolio would be the best performing structure in the Deflation Scenario, possibly reaching a double-digit return. 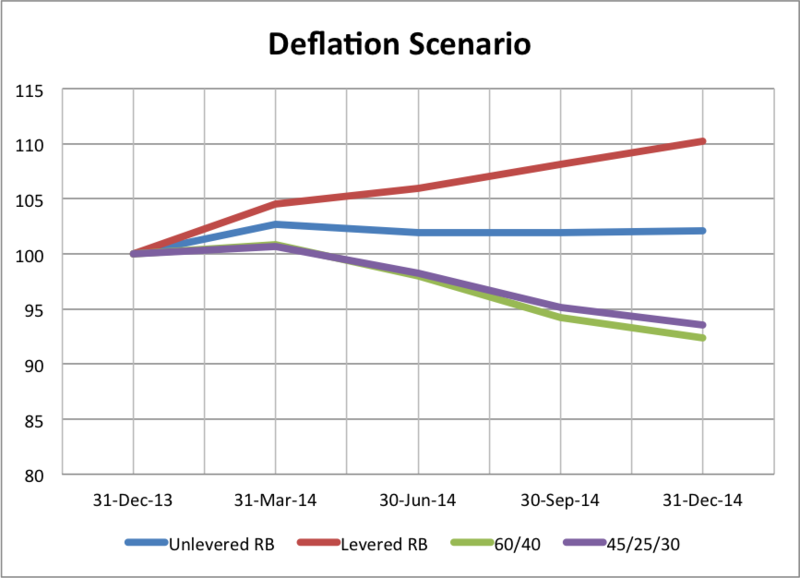 Finally, the Inflation scenario would be highly damaging to all of the portfolios. Equities, credit and nominal government bonds would all perform poorly in the event of significant upside inflation surprises that would hasten tapering of QE and bring forward expectations of central bank policy rate increases. Exacerbating these effects for Canadian dollar investors would be the effect of Canadian dollar appreciation. In fact, the portfolio that would perform best in this scenario would be the risk averse 45% Equity, 25% bond and 30% Cash portfolio, as the large cash position would mitigate the portfolio declines. The Levered Risk Balanced portfolio would be the worst performer as bond losses would be larger because of the large exposure to domestic and foreign nominal and inflation-linked bonds. Looking at the three scenarios, one is struck by the continuing risks to investing in the post-financial-crisis environment which has been characterized by unconventional monetary policies that have encouraged investors to move into risky assets and led to rich valuations for equities, bonds and credit. Given these valuations, the Consensus macro scenario, in which the Fed tapers and gradually ends Quantitative Easing, would provide only moderate positive returns. If the current Consensus does not play out, as it usually doesn't, there are great risks to both the higher-than-expected Inflation scenario and the slide toward Deflation scenario sketched out by Russell Napier. 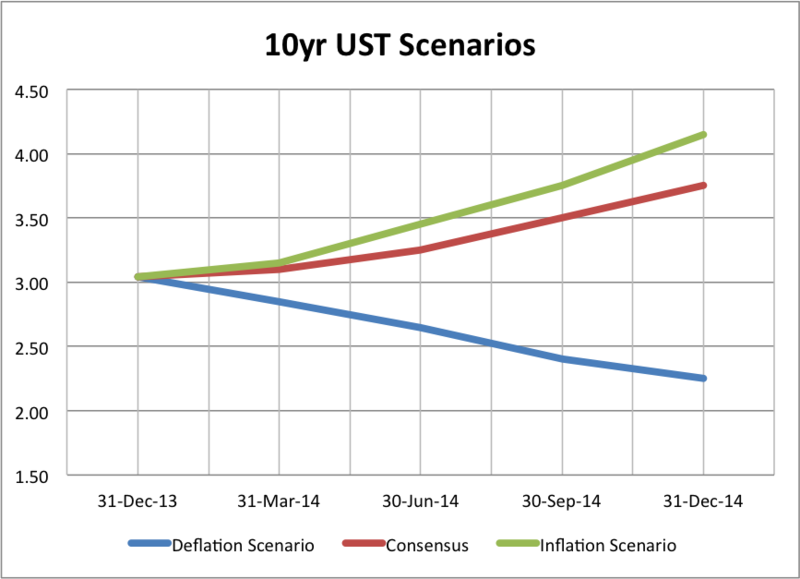 If one leans toward the higher-than-expected Inflation scenario, the preference would be the conservative 45% Equity, 25% Bond, 30% Cash portfolio. If one leans toward the slide toward Deflation scenario, the preference would be the levered global Risk Balanced portfolio. The most important takeaway from this analysis is the importance of taking a flexible approach and being prepared to make substantial asset mix shifts if the economy veers toward either the Inflation scenario or the Deflation scenario in 2014. 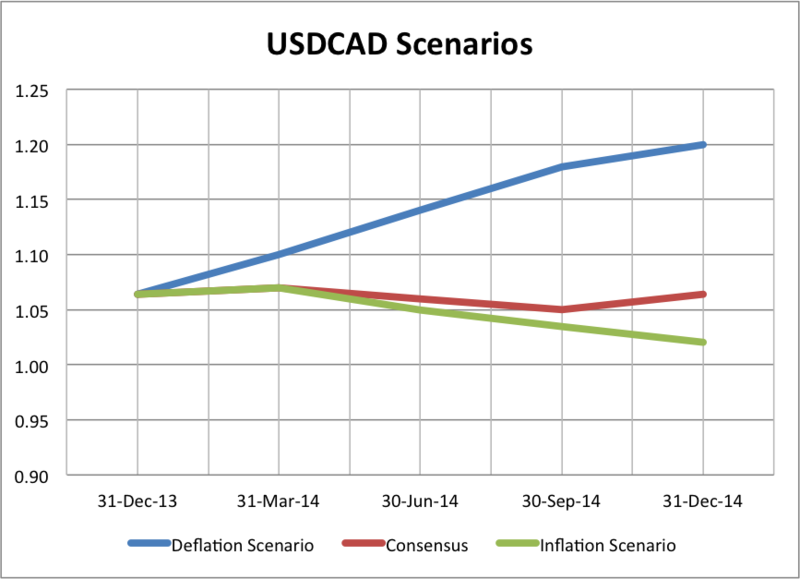 Hi Ted, why does USDCAD go to 1.20 on a deflation scenario?